This amazing interactive live Variety TV style Show will have you singing, dancing, laughing and crying! 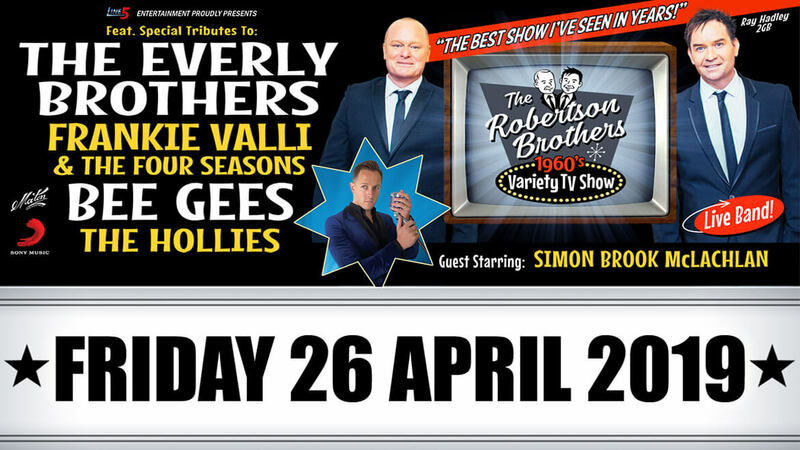 Take a trip down memory lane with The Robertson Brothers, Australias own vocal dynamic duo! The Robertson Brothers have toured the world with many well known acts including The Eagles, America, John Denver, ELO plus many more. They also performed at the Opening Ceremony of the 2000 Sydney Olympic Games. Many know them as the distinctive vocal sound on the theme for the hit TV soapie Home & Away and also by their regular political and football song parodies for Ray Hadley’s morning shows on 2GB and networked across Australia. With half a million record sales, 22 MO and ACE Awards, along with two ARIA and Golden Guitar nominations, The Robertson Brothers are unquestionably Australia’s leading vocal duo.